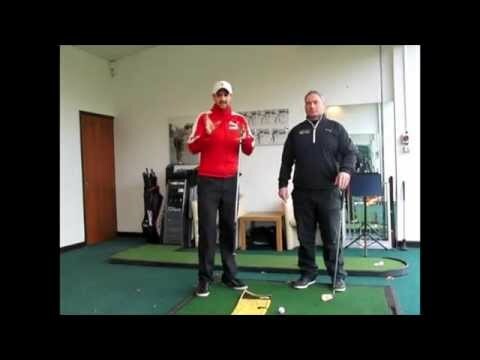 Today you were going to see a video with Alistair Davies and it is going to give you one very good golf drill to improve your compression and contact. Why is this so important ? Well compression and contact is what gives you consistency and distance control both of which will drastically help your scores. There are lots of ways to improve your consistency and contact especially with your irons but today you’re going to love a drill that is so immediate an effective in giving you instant feedback and results to get the strike of the golf ball that you want. Improving consistency compression and contact especially with your irons doesn’t need to involve complicated swing instruction or golf swing tips that are going to give you headaches. Because at the end of the day we want to practice using most efficient ways so by the time we get on to the golf course it starts to feel a little like second nature. And this drill that you can do regularly will really give you the results that you want. When you feel what it’s like to compress the golf ball and really get the desired ball first then divot and strike down and through you won’t look back on your game. But even when you know what it feels like, even as a better player, you still need to dial in this feeling and remind yourself what needs to occur. Sometimes though, we need to exaggerate the feeling to get the results that we want and this practice drill with a towel does just that. So all you need to do is place a towel an inch or two behind your golf ball to start with and take your normal set up and swing. The object is to strike down and hit your irons well, without making any contact with the towel. Give this golf practice drill a try and you will be hitting the ball with more penetration and control resulting in more consistency with your distance and accuracy. Hope you enjoyed that video and the entire series that we filmed with Alistair and maybe you want a quick online video analysis from Alistair Davies? Learn more here. So please go and use this golf practice drill and keep an eye out for some great lessons we have coming your way over the next few weeks to help you have the best season ever!